…. then they are heartened to know their beliefs are true. The thing they really should ask themselves first, though, is whether the book author accepted the statements and illustration without question, and did anyone preceding this author check the veracity of the details of the statements and illustration. 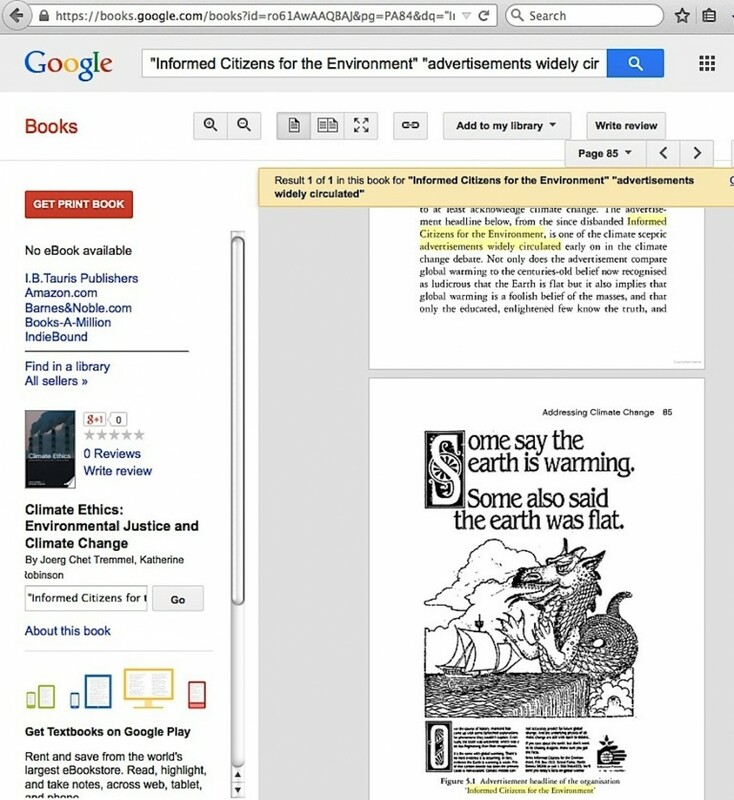 For example, just a brief research effort into the situation reveals that the spread of the ads this ‘climate ethics’ book refers to were described in a revered national newspaper article as being “tried out in Flagstaff, Ariz.; Fargo, N.D., and Bowling Green, Ky.”, hardly the definition of ‘widely circulated’, no matter who attempts to spin it otherwise. 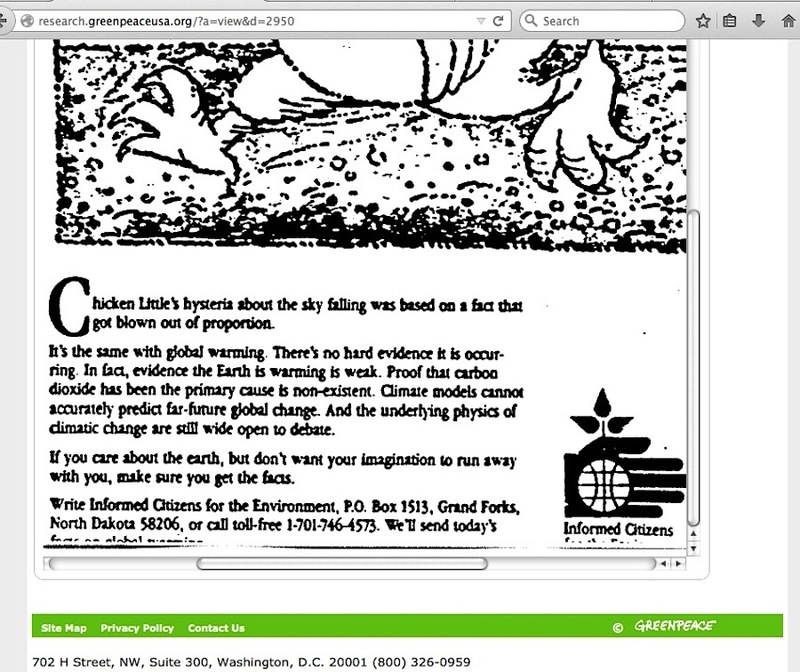 More problematic is the name of the organization shown in that old print ad and the ‘climate ethics’ book’s caption for it. The book has the acronym correct, “ICE”, but not the spelled-out name. The final name chosen by the public relations campaign’s administrators was the “Information Council for the Environment.” I defy anyone to provide evidence to the contrary. 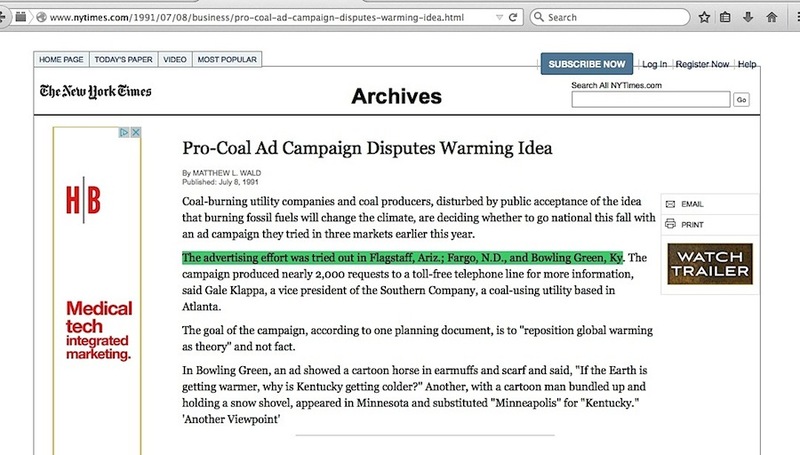 That is precisely why this book’s showing of an ad having the PR campaign name as the “Informed Citizens for the Environment”, and others repeating either that incorrect name or the words from it, is a problem to all those who believe leaked memos out of the ICE PR campaign are proof of a sinister industry / skeptics conspiracy. Greenpeace, in their QuitCoal web site, perhaps saw the problem of repeating the words “Informed Citizens for the Environment” – notice in their page here** [Author’s 4/18/16 addition: Greenpeace has since taken down that site, but I archived the page here. And now you see the reason why I provide screencaptures of many links I use] (screencapture here) – the “Chicken Little” ICE ad has just the headline and illustration. 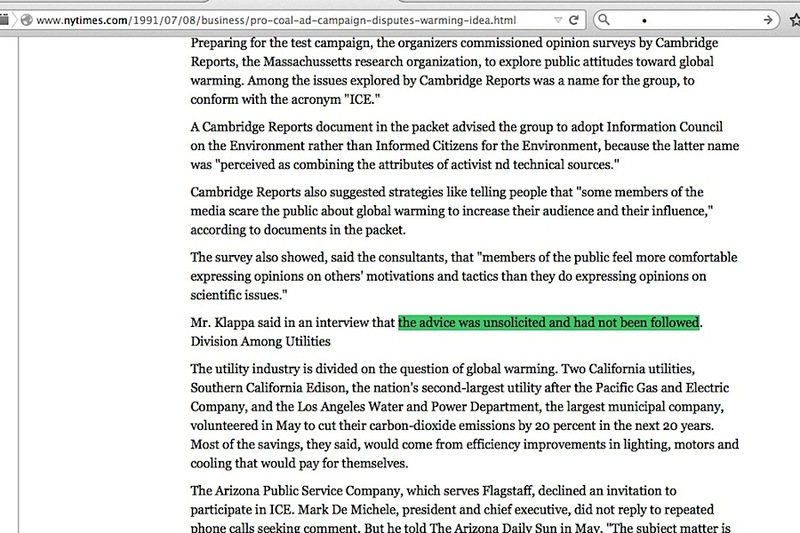 QuitCoal’s description of it states (highlighted in green in my screencapture) that the ad came “from a coal front group called Information Council on the Environment (ICE).” No ambiguity there, apart from the likely typo error of the word “on” for the correct word “for”. 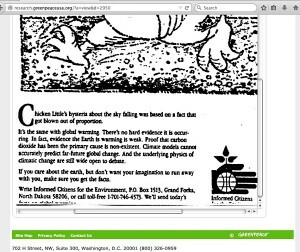 However, click on the link right below the description, and you are taken to a documentcloud.com page (screencapture here) where Greenpeace’s Cindy Baxter had apparently uploaded a version with blurry text below the illustration. Ms Baxter has a link just above her name for “Original Document (PDF)”, but clicking on that only takes you to an amazonaws.com page (a “durable, highly-scalable object storage service”) that is no real improvement. What an incredibly odd thing to do. 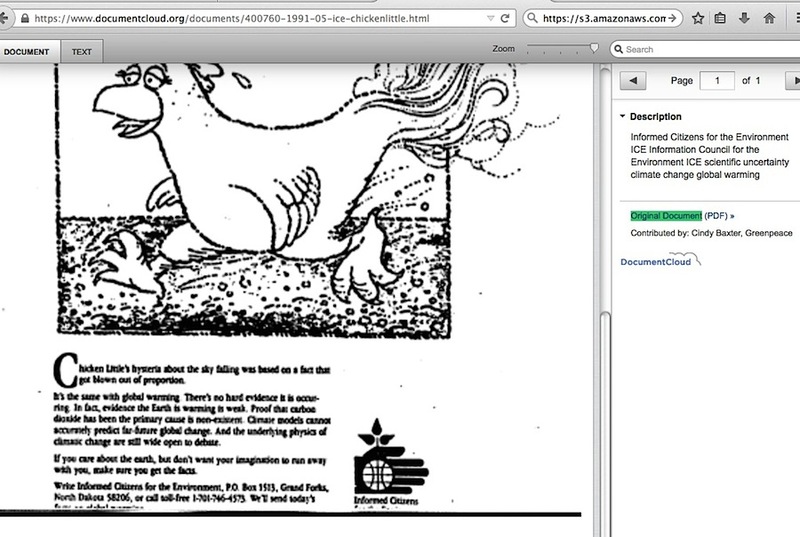 Ever since 2007, Greenpeace has had their incomplete set of ICE documents and memos right in their own online arguably ‘durable, highly-scalable object storage’ archive pages. As I pointed out last year, I’ve only found one pro-global warming entity linking straight to Greenpeace’s ICE scans, and it wasn’t Greenpeace. 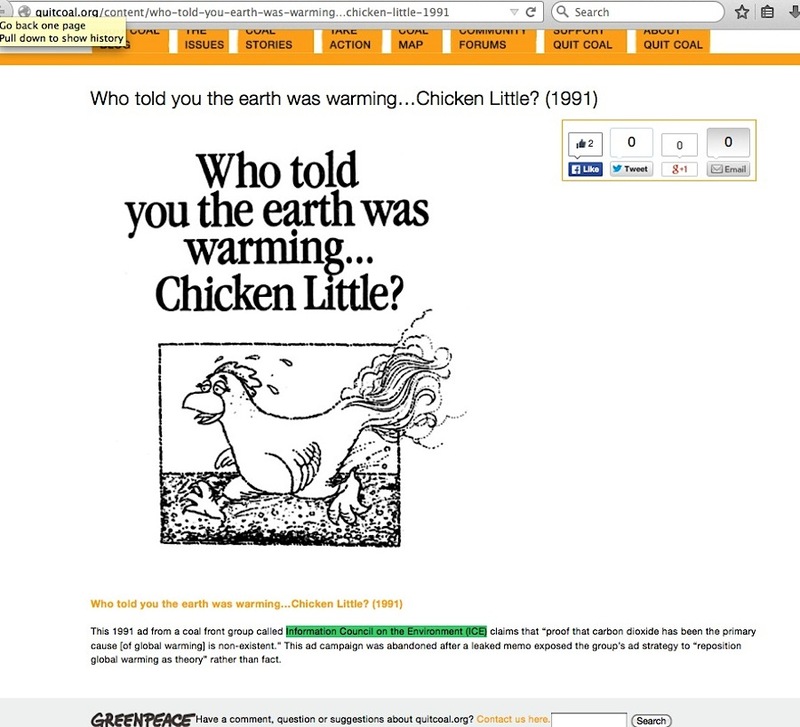 Fun thing about the Greenpeace scans (the Chicken Little ad is at their page 58), you can click on the thumbnails to get an enlarged view below the thumbnail, and when you click on the enlarged view, you get a much magnified view of any portion of the page you wish. From that much clearer view, two problems are clearly seen in the last two lines of the ad text (click to enlarge). In my previous blog post, I pointed to a particular passage in a 1991 NY Times article about the leak of the ICE PR campaign, where one official of the campaign said that certain demographics targeting advice was neither solicited or followed. The response he gave to the reporter might well have applied to advice about not using the name “Informed Citizens for the Environment”, but the way the NYT article is written, that appears unclear. So, even though I don’t consider myself a journalist in the strict sense of the definition, I do adhere to journalism standards that might make the late Washington Post editor Ben Bradlee proud. I have it confirmed by two other independent people who worked in the ICE PR campaign: No ad appeared in print publications with the name /logo of the “Informed Citizens for the Environment.” If others, friendly or hostile to what I say undertake this same effort, I am certain they will also find those same corroborations and likely at least two more. So, Greenpeace’s and others’ usage of “Informed Citizens”-labeled ICE ads as evidence is no nice, tidy, crystal clear effort, it only prompts deeper questions about what was actually in that campaign, what actual effect the campaign had considering its short and obscure duration, and why anyone would place their unconditional faith in questionable leaked documents as evidence of a sinister fossil fuel industry effort, instead of first establishing the validity of the documents. This entry was posted in Information burial, Information Council for the Environment, Western Fuels Association by Russell Cook. Bookmark the permalink.